An international team of astronomers, including Carnegie Mellon University graduate student Kivanc Sabirli, recently announced the discovery of the most distant cluster of galaxies ever found at the 208th American Astronomical Society meeting in Calgary. The cluster may also be the most massive one yet seen at such an early era in the Universe, according to the team. "The key question now is: What's it doing there?" said Robert Nichol, professor at the University of Portsmouth, U.K., and a co-author on the paper. "This massive lump of dark matter is three-quarters of the way back to the Big Bang." Almost 10 billion light-years from Earth, cluster XMM-XCS 2215-1734 contains hundreds of galaxies surrounded by superheated, X-ray-emitting gas at more than 10 million degrees. The XMM Cluster Survey (XCS) team used observations from the European X-ray Multi Mirror (XMM) Newton satellite to discover this new cluster and then determined its distance using the 10-meter W. M. Keck telescope in Hawaii. The distant cluster appears to be full of old galaxies, said lead author Adam Stanford, a research scientist at UC Davis and at the Lawrence Livermore National Laboratory. "It is a challenge for our models of the way massive galaxies formed, and to our understanding of how such massive clusters could exist at a relatively early era in the Universe," Stanford said. "It's like finding a picture of your grandfather as an adult in the nineteenth century — how could he have existed so long ago?" The cluster was relatively easy to find, said Kathy Romer, lecturer at the University of Sussex, U.K., and principal investigator of the XCS team. It was detected in observations that it only covers one-tenth of a percent of the whole sky, she said. The international team is searching archived observations from the Newton satellite for more clusters, and already has nearly 1,000 other candidate galaxy clusters that require confirmation using ground-based optical telescopes. XMM-XCS 2215-1734 is surprisingly massive. Using the temperature of the X-ray emitting gas, Sabirli, a graduate student in Carnegie Mellon's Physics Department, determined that the cluster is approximately 500 trillion times the mass of our sun. Most of the mass is "dark matter," a mysterious form of matter that dominates the mass of all galaxies and clusters in the universe but can not be seen by our telescopes. The team has embarked on a long-term observing program led by XCS team member Chris Miller of the U.S. National Optical Astronomy Observatory (NOAO) to find hundreds more clusters like XMM-XCS 2215-1734 using telescopes around the world, including the 4-meter telescopes of the NOAO at both the Cerro Tololo Inter-American Observatory (CTIO) in Chile and the Kitt Peak National Observatory in Arizona, and the W. M. Keck 10-meter telescopes. "It bodes well for the future and I expect the XCS to be the premier catalog of clusters for years to come," said Chris Collins, professor at Liverpool Johns Moores University, U.K., who is coordinating the optical observations. While the search for more clusters continues, the team will be studying XMM-XCS 2215-1734 with all the tools available, including the Hubble Space Telescope, Stanford said. 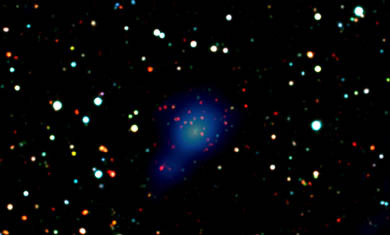 The galaxy cluster is a fossil of the early universe and therefore will be treasured by all astronomers, he said. The research team includes: Michael Davidson and Robert G. Mann, University of Edinburgh, U.K.; Matt Hilton and Chris A. Collins, Liverpool John Moores University, U.K.; Pedro T.P. Viana, Universidade do Porto, Portugal; Scott T. Kay, Oxford University, U.K.; Andrew R. Liddle, University of Sussex, U.K.; Christopher J. Miller, National Optical Astronomy Observatory, Tucson; Robert C. Nichol, University of Portsmouth, U.K.; Michael J. West, University of Hawaii and the Gemini Observatory, Chile; Kivanc Sabirli, Carnegie Mellon University; S. Adam Stanford, UC Davis and Lawrence Livermore National Laboratory; Christopher J. Conselice, University of Nottingham, U.K.; Hyron Spinrad, UC Berkeley; Daniel Stern, Jet Propulsion Laboratory; and Kevin Bundy, California Institute of Technology. The work was funded by NASA, the Particle Physics and Astronomy Research Council (U.K.), the Hosie Bequest and the National Science Foundation.